Dr. Mustafa Baskaya is a professor at University Hospital. He has a strong and diverse background in both research and clinical care. He specializes in surgery for cerebral aneurysms, arteriovenous malformations, cavernous angiomas and revascularization for stroke such as carotid endarterectomy, bypass surgery, complex brain tumors with deep locations (gliomas and metastatic tumors) and tumors of the skull base such as meningiomas, acoustic neuromas and and pituitary adenomas. Dr. Baskaya also provides microsurgery of spinal cord tumors. 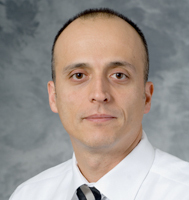 Dr. Baskaya has published numerous papers concerning the surgical management of intracranial aneurysms, subarachnoid hemorrhage, microsurgical anatomy of the skull base and cerebral ischemia and brain injury after trauma. He serves as an associate editor of Neuroanatomy Journal and an editorial board member of Annals of Neurosurgery (e-journal).